PIPESTEM, W.Va. — Lift your eyes to the mountains and skies Saturday, Jan. 6, to look for eagles and other raptors during the 13th Winter Eagle Survey. This annual bird-watching event will be conducted across West Virginia by volunteers known as “The Eagle Brigade.” The Winter Eagle Survey will start at 10 a.m. and end at 2 p.m.
“The eagle population is growing in West Virginia, and the Winter Eagle Survey is a great time to get out and see these magnificent birds,” said Jim Phillips, retired Pipestem Resort State Park naturalist and one of the many eagle survey volunteers. 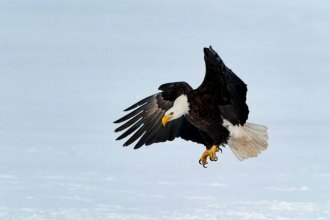 In January 2017, 50 bald eagles and one golden eagle were recorded during the survey. During the March 2017 survey, 40 bald eagles were recorded at eight sites. Observation sites are staffed for four hours and are typically located in Summers, Greenbrier, Raleigh, Monroe, Lewis and Taylor counties. Afterward, observers in the Bluestone/Pipestem area in southern West Virginia will meet in Hinton to review their observation counts and reports. The second Eagle Survey will be March 3. To register to be part of the Eagle Brigade, email or call Julie McQuade at Julie.A.McQuade@wv.gov or 304-466-1800, or contact Wendy or Ron Perrone at Three Rivers Avian Center at 304-466-4683 or trac@tracwv.org. Participants will be partnered with brigade volunteers and assigned a survey site, and should dress appropriately for the weather, bring binoculars if possible, and pack snacks or water.